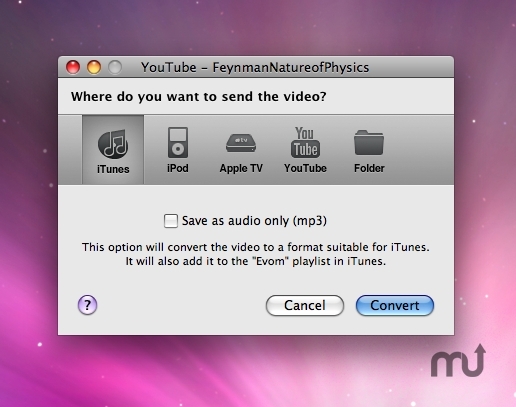 Convert videos for playback on iPod, AppleTV, or iTunes. Is there a better alternative to Evom? Is Evom really the best app in Entertainment category? Will Evom work good on macOS 10.13.4? Evom makes grabbing and converting videos a breeze. Do you want to convert those pesky AVIs or WMVs into a useful format? Had an urge to watch LOLcats on your iPod touch? Evom converts videos for breakfast and does it with Apple style and the ease of drag-and-drop. Put your videos where they belong - on your iPod, iTunes, or Apple TV.